« Thrift Store $3.00 bag sale! Quyana! 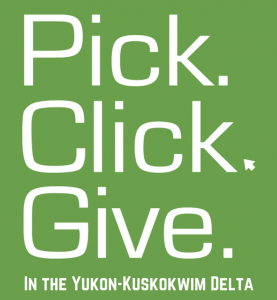 Pick.Click.Give Donors! Thank YOU! TWC wants to thank everyone who donated a portion of their Permanent Fund Dividend throught the Pick.Click.Give. program in 2012. TWC received over $15,000 for services and activities as a result of your generosity. Quyana! It’s time again to file for PFDs – please consider supporting TWC. Give dollars are making a difference!